Camille Pissarro (1830–1903), Automne, Peupliers, Éragny (Autumn, Poplars, Éragny) (1894), oil on canvas, 102.9 x 81.9 cm, Denver Art Museum, Denver, CO. Wikimedia Commons. Many of the finest landscape paintings consist of just three major elements: the sky, terrain, and trees. Some are little more than portraits of trees. In this new series of articles, I am going to concentrate on the depiction of trees by individual Western painters, where those trees form a substantial part of the motif: in common terms, either the subject or making a strong bid to be the subject. This introduction gives a general account of how such depictions have evolved over time, starting with early landscapes by Rubens and Poussin, and ending at the time of the First World War, when modernism was becoming popular. It considers some of the themes which I will develop in more detail during the rest of the series, each article of which will focus on one artist, and show some of the finest of their paintings of trees. There are few areas of the earth’s land surface which do not feature at least a few trees; most of the locations in which European and American landscape painters have been most active have many trees, even in the most developed of urban areas. Trees appear in the great majority of Western landscape paintings, and in a great many Asian paintings too. Humankind has always had an intimate relationship with trees. In life, they provide fruit, shelter, and shade; when dismembered, they provide building material, complex structures like boats, and fuel. We process them into paper, and use their secretions to make rubber. Even if you don’t go round hugging them, trees have character and add character – such as the plane trees along London’s Embankment and the Champs Élysées in Paris, and the linden (lime) trees of Berlin. 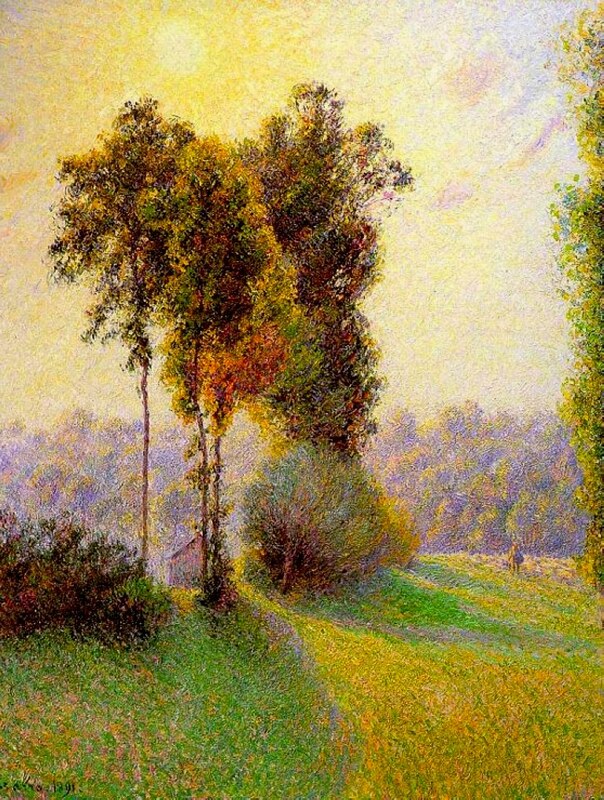 Trees are also one of the most complex and detailed objects which feature in landscape paintings. Even among the best landscape painters, there are those who excel at trees, clearly loving every brushstroke they make to portray each tree, and those who remain ill-at-ease when painting trees. Here then is a celebration of some of the very best. Like many artists since, Peter Paul Rubens made studies of trees to support his studio paintings in oils. This, known simply as Landscape (c 1635-40), is a careful and quite detailed sketch in gouache (or opaque watercolour) of a group of trees on the bank of a small river. The evidence, from the tree in the mid-right, is that he constructed them anatomically, by putting in the structural curves and lines of the branches, then laying down areas of foliage – a method which remains the most popular today. 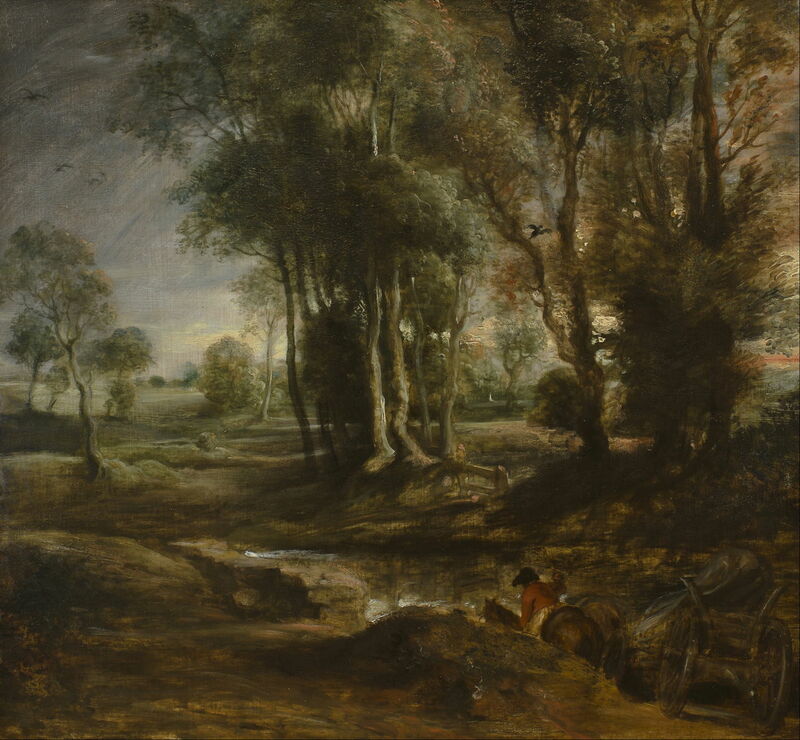 Peter Paul Rubens (1577–1640), Evening Landscape with Timber Wagon (c 1630-40), oil on panel, 49.5 x 54.7 cm, Museum Boijmans Van Beuningen, Rotterdam, The Netherlands. Wikimedia Commons. Back in the studio, Rubens used those studies to assemble larger paintings in oil, such as Evening Landscape with Timber Wagon (c 1630-40). They were still constructed using the anatomical method, and in some sections of foliage the underlying branches can be seen. Although they are backlit and shown in the gathering dusk, he placed quite gestural highlights on some trunks, and used tonal range to give the foliage depth. Many of Nicolas Poussin’s paintings employ foreground trees to frame the view in repoussoir, enhancing the sense of depth. 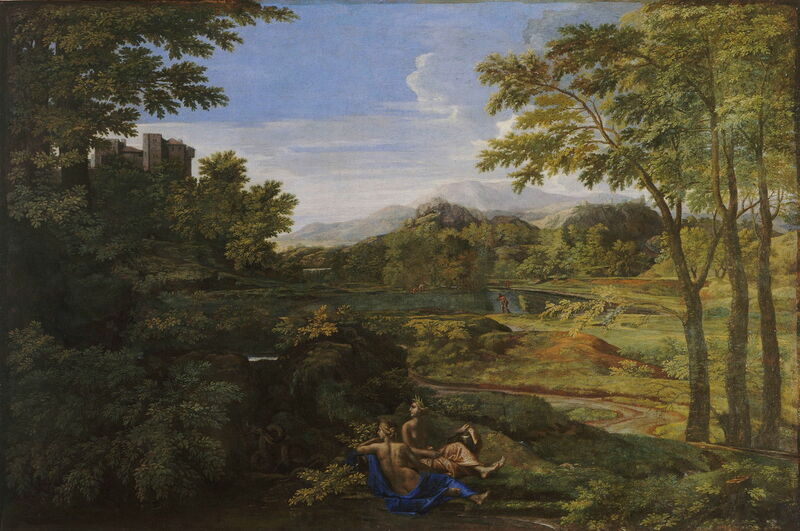 Paysage avec deux nymphes et un serpent (Landscape with Two Nymphs and a Snake) (c 1659) is slightly unusual in that the trees on the right are more than a framing device, and are established as an important part of the whole view. 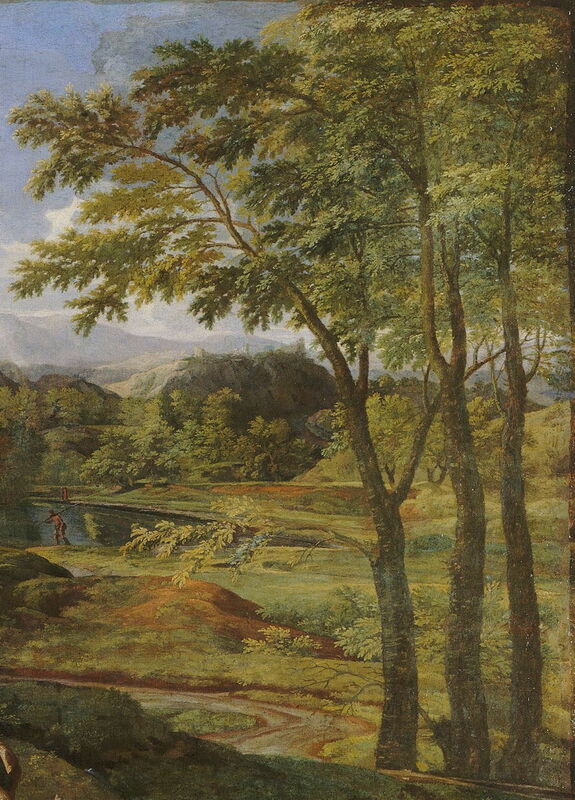 Seen in this detail view, Poussin has cleverly varied the amount of detail shown in the foliage, as well as its tone and colour, to ensure that the trees do not appear flat, like a sylvan proscenium arch. Fine detail on the lower trunks gives them a very realistic texture, as an alternative to the highlights which would have been shown had they been in different light. This painting also shows evidence of Poussin’s use of the anatomical method. 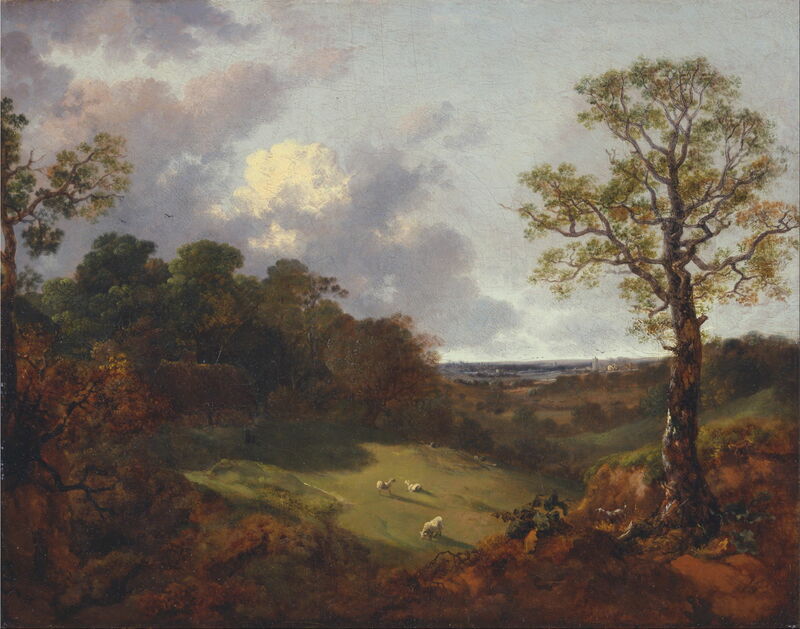 Thomas Gainsborough was arguably more accomplished in his depictions of trees than he was of the portraits which earned him his living. His Wooded Landscape with a Cottage and Shepherd (1748-50) is dominated by a single tree, whose wonderfully gnarled and lichen-encrusted bark threatens to subsume the shepherd at its foot. Sadly the tree’s rather thin foliage appears to have become more transparent with time. However this does reveal the whole of the tortuous branch system, and demonstrates clearly his use of the anatomical method: each branch could have come from a textbook on the painting of trees. 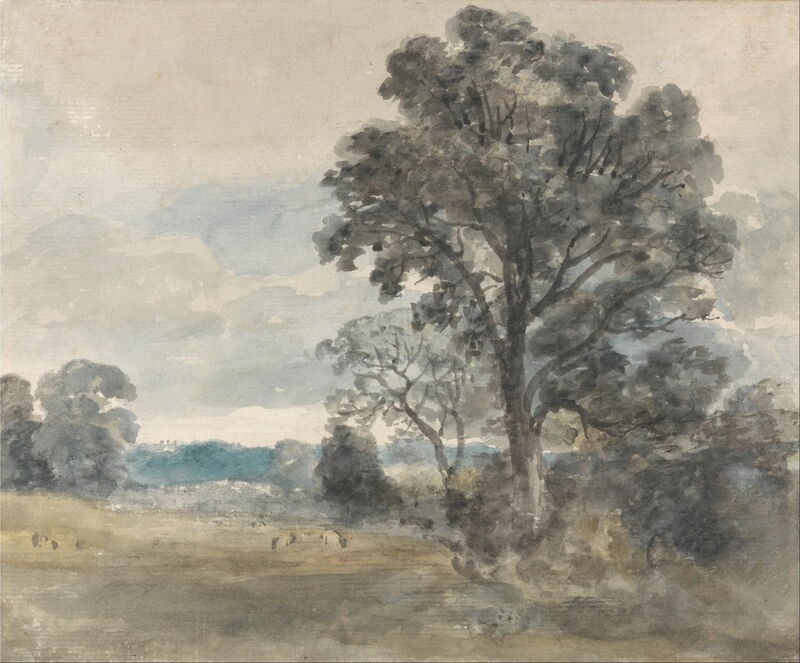 John Constable (1776–1837), Landscape at East Bergholt (c 1805), watercolour, 17.8 x 21.6 cm, Yale Center for British Art, New Haven, CT. Wikimedia Commons. John Constable was a great fan of Gainsborough’s trees and landscapes, and an avid plein air sketcher using both watercolours and oils. 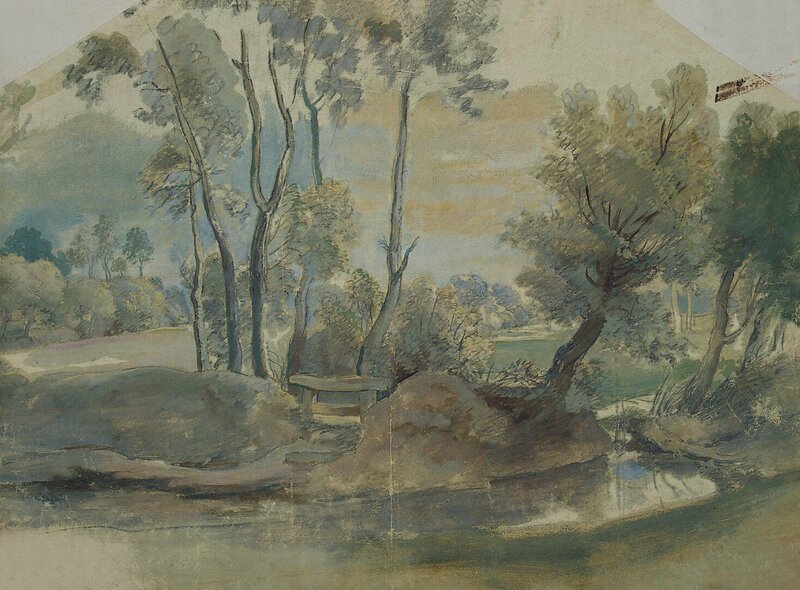 This Landscape at East Bergholt (c 1805) was a very quick work in watercolours, but he still took time and care to ensure that its trees, particularly the dominant one filling the right half of the paper, were carefully constructed on anatomical lines. Constable’s finished studio paintings were inevitably much richer in fine detail. 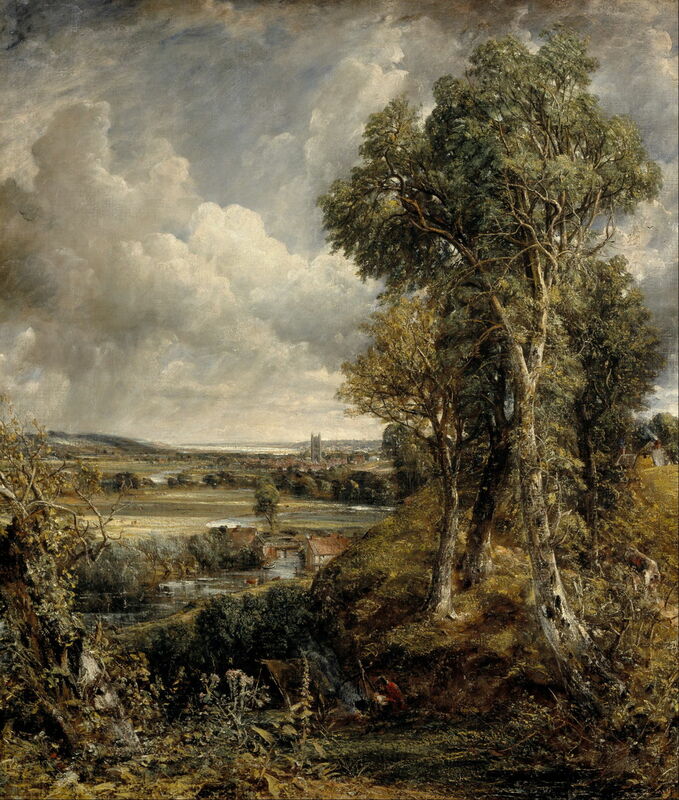 The Vale of Dedham (1828) employs a similar compositional form to his East Bergholt sketch, although the trees and distant setting are quite different. Textural detail in the bark of the lower trunks is meticulous rather than gestural, and unlike Poussin, the level of detail in the foliage varies little. Constable’s more painterly style seen in his oil studies – particularly the final full-size studies for his ‘six footers’ – often appears more effective than the finished works. As Constable was painting his later works, Jean-Baptiste-Camille Corot was starting his career by becoming the most skilled plein air painter of his generation. 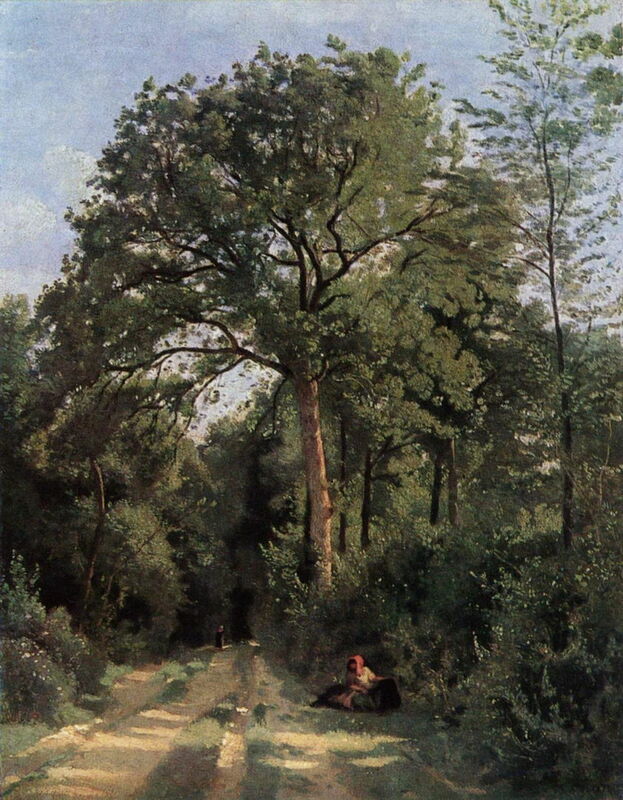 Although his Ville-d’Avray: Entrance to the Wood (c 1825) was clearly painted at speed, and lacks the detail of Constable, it is very unlikely to have been completed in a single sitting. Most of Corot’s landscapes feature trees, and his approach to them varied considerably. In this painting there is an intermediate level of detail, sufficient for him to structure marks forming the leaves of the smaller tree in the right foreground, but the central and dominant tree has its foliage shown en masse. Caspar David Friedrich, Man and Woman Contemplating the Moon (c 1827), oil on canvas, 34 × 44 cm, Alte Nationalgalerie, Berlin. Wikimedia Commons. 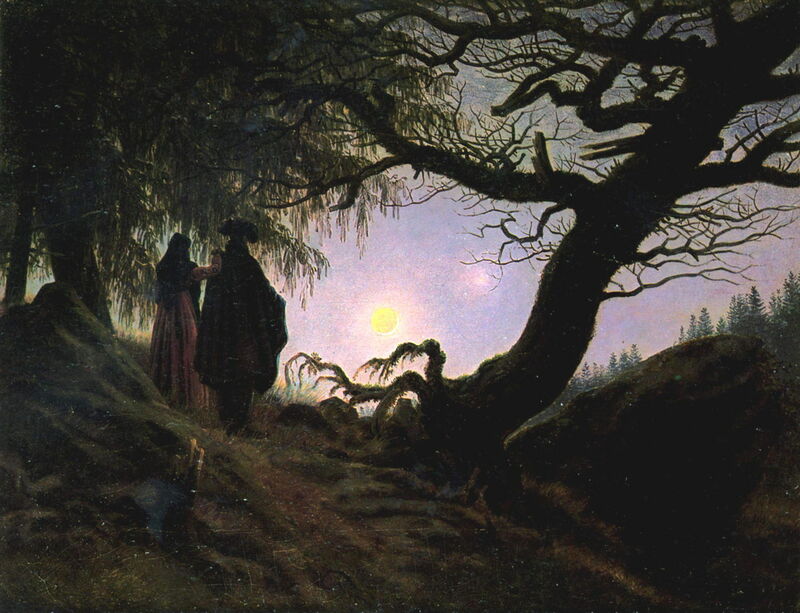 Caspar David Friedrich’s haunting Man and Woman Contemplating the Moon (c 1827) contrasts the pendant foliage of the tree at the left with the twisted and barren branches of that occupying much of the right half of the painting. Looking directly into the light, at twilight, the gnarled treee is shown in silhouette, which draws attention to its peculiar and even unearthly appearance. 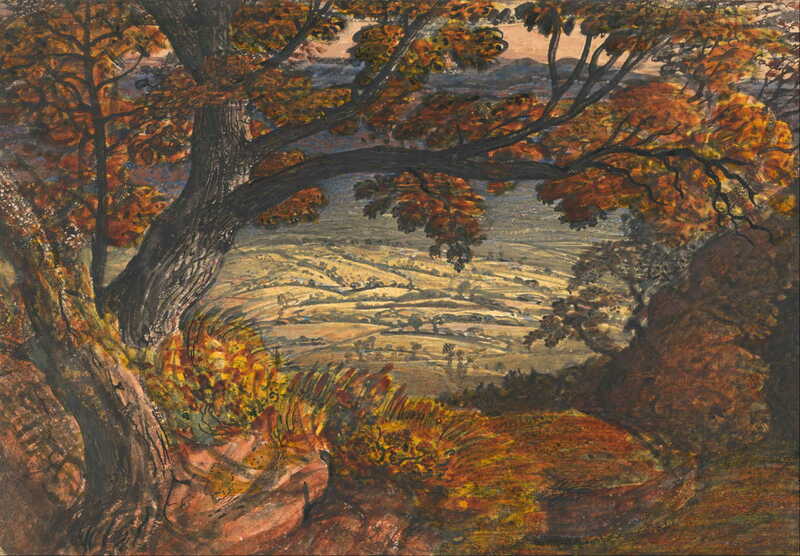 Just a few years later, Samuel Palmer’s The Weald of Kent (c 1833-4) used a tree to construct the deepest repoussoir yet, in which the motif proper forms but a small area in the very centre of the painting. Palmer’s billowing foliage looks more solid and less leafy, and it glows rich gold in the autumn sun. 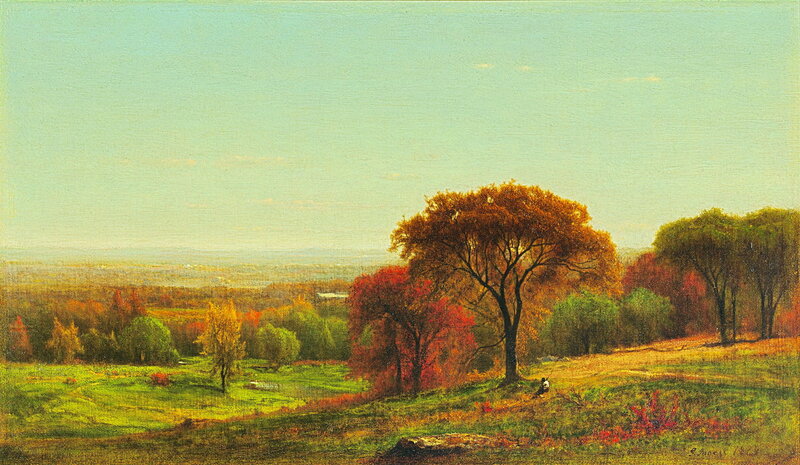 The brilliant colours of autumn gave George Inness inspiration for Across the Hudson Valley in the Foothills of the Catskills (1868). Here the contrasting gold, red, and still green trees is so marked as to appear almost unreal. He also provides good visual evidence of his use of the anatomical method in their construction. 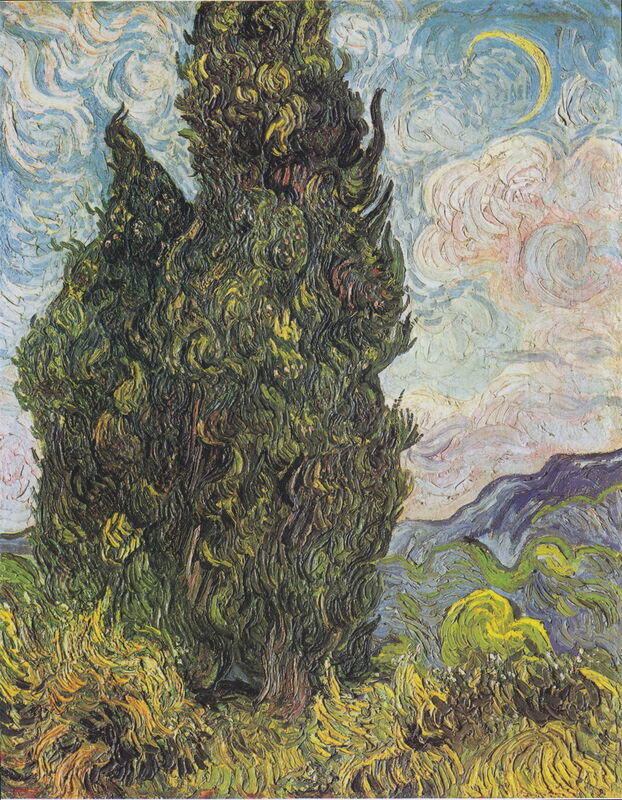 Vincent van Gogh’s Cypresses (1889) are some of the best-remembered trees of all. As he moved style on beyond Impressionism, his swirling brushstrokes form solid but thoroughly living trees. 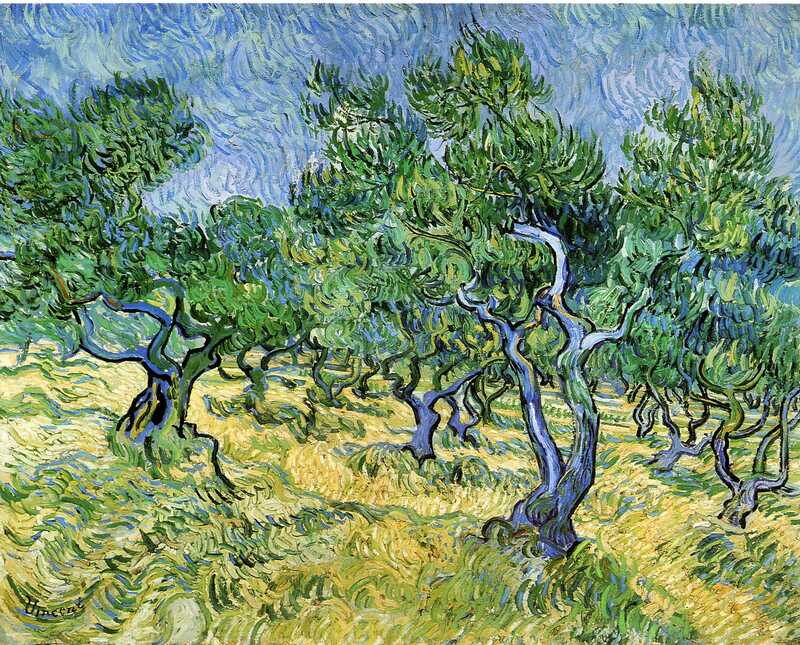 In his Olive Grove (1889), those swirling strokes of foliage complement the tortuous curves of the branches and blue trunks. 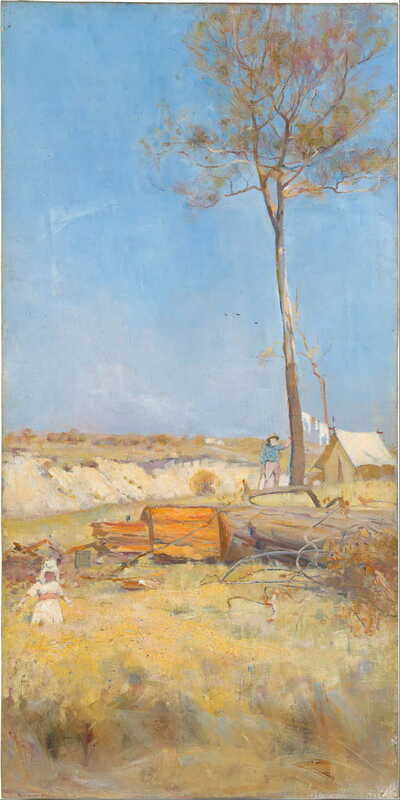 This straggling beanpole of a tree could not be further from van Gogh’s, in Charles Conder’s Under a Southern Sun (Timber Splitter’s Camp) (1890). This is on the other side of the world, its lofty leaves a thin smattering against the hot sky. The extreme height of the tree contrasts too with the tiny human stood at its foot. Throughout his long and very productive career, Camille Pissarro’s landscapes are rich with trees, and his trees are richly worked. This view into the low sun of Saint-Charles, Éragny (1891) is as rich and saturated in colour as that of Inness, but bears the colour spots of Divisionism (Neo-Impressionism), and its stippled details. 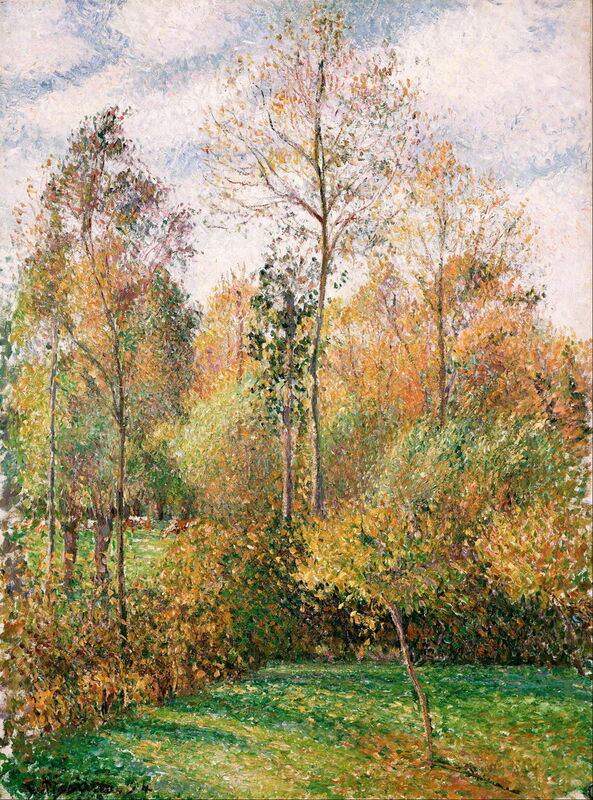 A few years later and his stippled texture having changed, Pissarro’s Automne, Peupliers, Éragny (Autumn, Poplars, Éragny) (1894) captures the dry leaves so well that you can almost hear them rustling and shimmering in the breeze. Paul Cézanne, Almond Trees in Provence (1900). Graphite and watercolour on paper, 58.5 x 47.5 cm, private collection (WikiArt). Paul Cézanne’s oil paintings of trees, although abundant, have tended to suffer the consequences of his emphasis on patterned brushstrokes (‘the constructive stroke’). 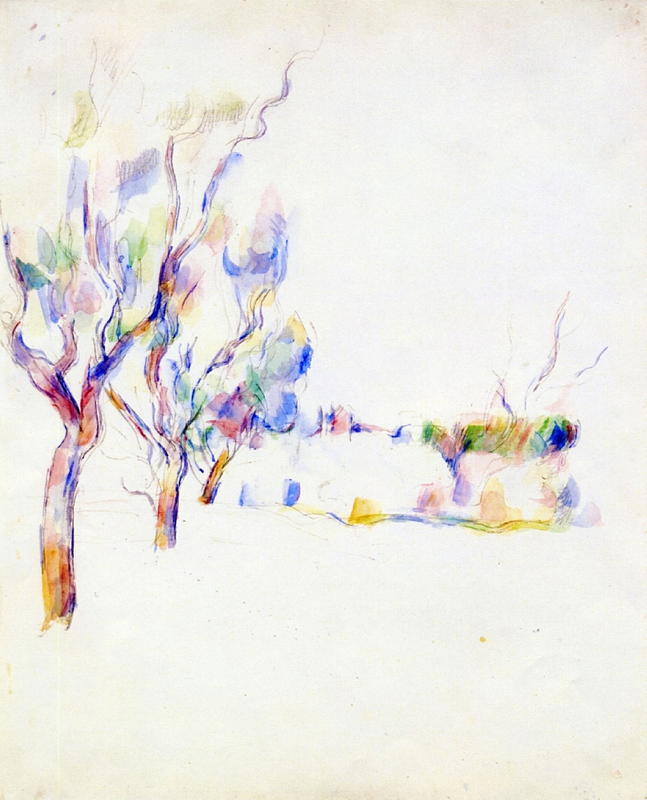 This was not true of his watercolours, as shown in Almond Trees in Provence (1900), where each tree rises in a flare of bright colours. 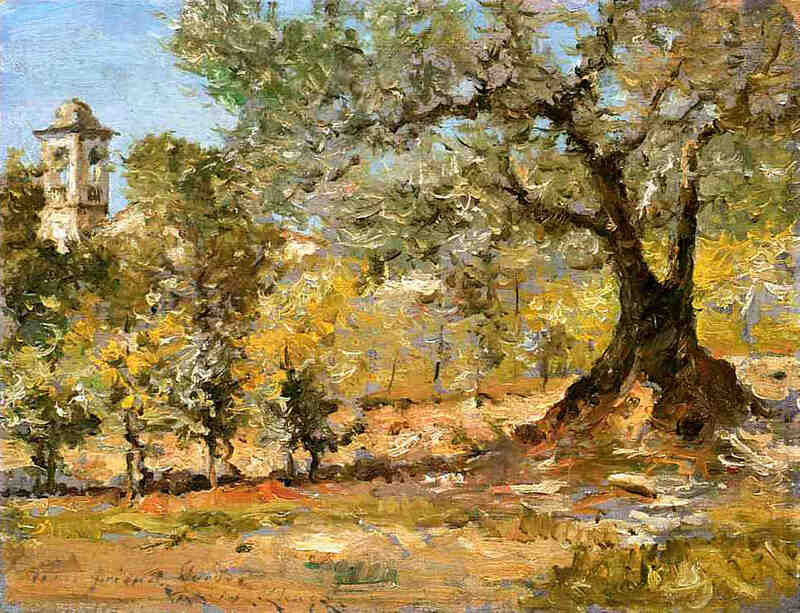 It is worth comparing William Merritt Chase’s treatment of Olive Trees, Florence (1911), with van Gogh’s above. Highlights among the leaves, in particular, are highly gestural, in places resembling the drips and runs which might be more characteristic of much later in the twentieth century, and the likes of Jackson Pollock, perhaps. Théo van Rysselberghe, Pine by the Mediterranean Sea (1916), oil on canvas, 81 x 199 cm, Centraal Museum, Utrecht. WikiArt. 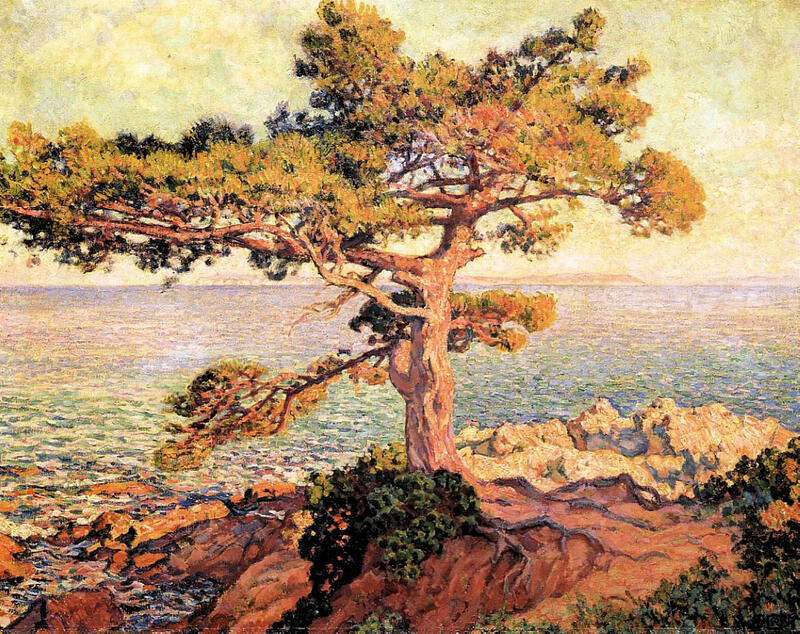 Finally, Théo van Rysselberghe’s Pine by the Mediterranean Sea (1916) appears almost as substantial as the bleached rocks below it. Contrast between the lit segments and those in cast shadow behind is very wide, as is experienced on the shores of the Mediterranean. I hope that you will join me in the next article, in the coming few days. Posted in General, Life, Painting and tagged Cézanne, Chase, Conder, Constable, Corot, Friedrich, Gainsborough, Inness, landscape, painting, Palmer, Pissarro, Poussin, Rubens, trees, van Gogh, van Rysselberghe. Bookmark the permalink.